← Supper surprise – limits create art. Sometimes I think that I just like buying beads. The potential is always more interesting than the reality. Seeing all the beads together in the bin- I go a little wild. When I have to pick what I’m going to work with, I am a little overwhelmed. There are so many choices, but I can’t use them all. I like that at least if I change my mind I can take the necklace apart and do something else. Somehow that makes it easier to get started. Sometimes I just want minions. I’ll finally work out the pattern that will use the beads in a way I like, and then it is all about just doing the work. This is so boring. This part is not the part that keeps me beading. Some of what I make is really boring. Sadly, this kind of stuff sells well, so I make a fair amount of it. Sometimes I think I make it so that I can afford to make what I really want to make. Figuring out the pattern can be the hardest part, yet the most rewarding. There are a lot of factors to consider. Necklaces have weight that is both physical and visual. I don’t want to make something that is very heavy and thus a pain to wear. Some designers don’t seem to ever wear what they make, so they don’t get that this “art” piece is completely impractical to wear longer than twenty minutes. Then there is visual weight. If there are a lot of large beads very close to each other, the necklace will look heavy. This is ok for certain people, but not others. In general, older and larger women like “heavy” designs, while younger and thinner women like “lighter” designs. Here is an example of a “light” design. 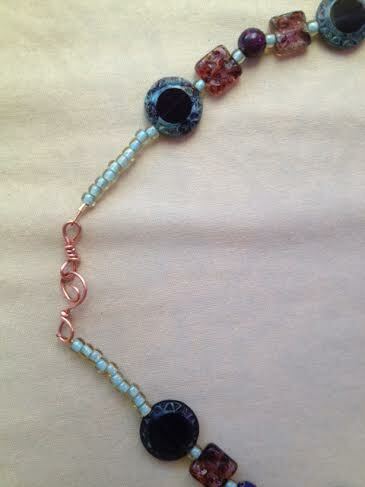 This is an end-of-week necklace, made with leftover bits of other projects. 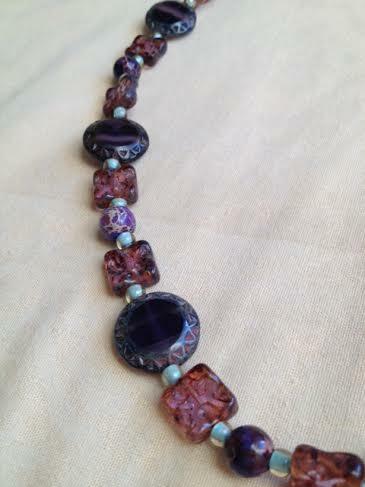 Making a heavy piece lighter often just means adding some plain glass beads into the pattern. This also reduces the cost, which is another factor. You may make the most beautiful necklace ever, but people will simply not want to pay for it. 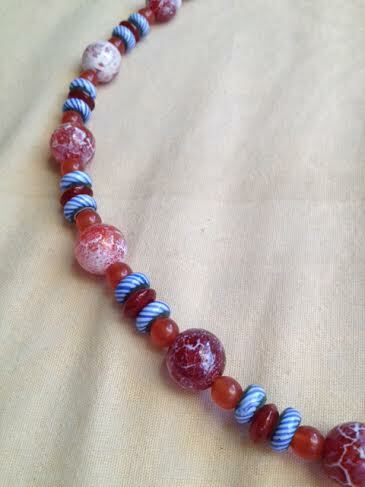 These are heavy beads, but I’ve watered it down by adding some plain glass beads. 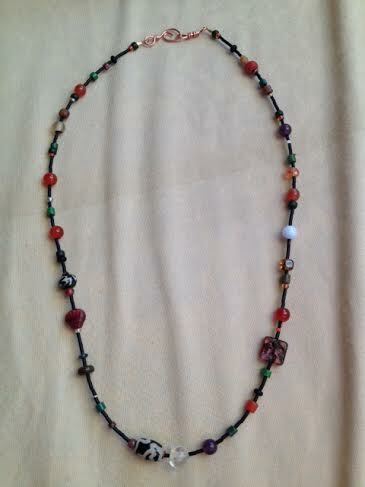 I was interested in making a big chunky necklace but didn’t have enough of the big beads to make it work. I’m trying to not get obsessive about what I make to the point that I have to go to the bead store to finish out a design. If I really want to make that specific piece a specific way, I’ll remember it the next time I’m at the store and just make a second version of the necklace. Would you believe that the cost of just the beads alone in this necklace is $80? And that is just the ones I used. I had to buy the whole strand of antique chevron beads. That was $200. 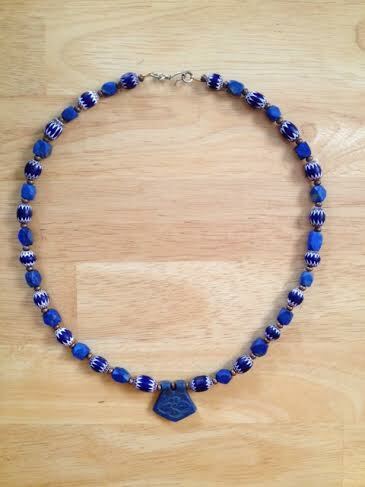 The strand of pre-Islamic cut lapis lazuli wasn’t cheap either. I did manage to get the centerpiece for free. There is something to be said for not being pretentious at a bead show. Sometimes I have just a few beads for a necklace and I want to use them up. I’ll work out a decent pattern and then be short a few inches. Then I have a choice. 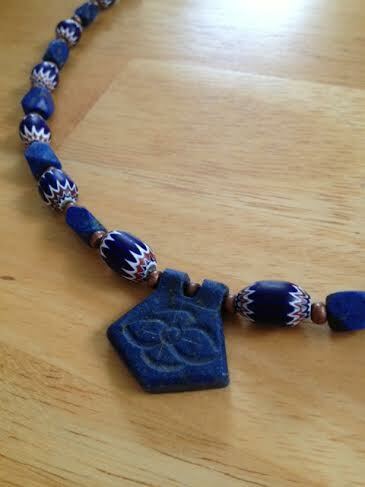 Take the whole thing apart and figure out another design, or just add some filler beads to the end. Nobody looks at the back of the necklace anyway, right? And, after all, it isn’t like I’m going by a pattern that anybody knows. They won’t know I didn’t mean for it to look like that. I guess that is part of it. Nobody knows what I’m aiming for, so when I miss they don’t know. I think that is true with everything. Just do it anyway. Keep on trying. Keep on making and writing and drawing and beading. Keep on putting it out there. Maybe one in twenty is a keeper, is one that I think ended up somewhere near what I was aiming for. But I think that is the trick. If I don’t keep trying, I won’t keep getting that one at all. The funny part is “the one” is the least likely to sell if it is jewelry. In my writing, “the one” that really matters is only rarely noticed. I have to remember that even if others don’t get it, I do, and that is good with me. If you don’t love your art, quit doing it, because it isn’t about the money. Well, getting money helps. Don’t get me wrong. I love it when my jewelry sells. Now, in part I love it because it means I can buy more beads to make more jewelry. It is about the chance to create, and thus the chance to get it right. Creating is like mastering a language. You’ll get really frustrated trying to express yourself until you figure it out. Either you need a new set of words or a new phrase or a different way to communicate. Perhaps you need sign language, or poetry, or email. Perhaps you just need to keep slogging away at it until you figure it out. This entry was posted in Beads and tagged art, art as a metaphor for life, art supplies, Creating a Life, visual language. Bookmark the permalink.